Your company's next product will be a new game, which is a three-dimensional variant of the classic game "Tic-Tac-Toe". 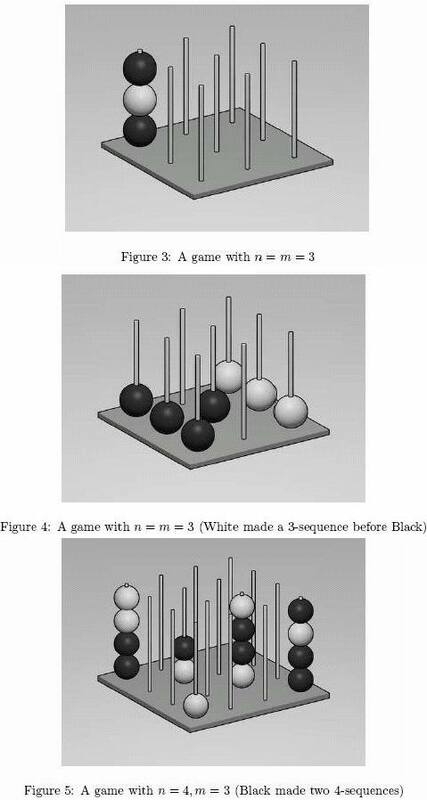 Two players place balls in a three-dimensional space (board), and try to make a sequence of a certain length. You can see several snapshots of the game in Figures 3-5. These figures correspond to the three datasets given in the Sample Input. Here are the precise rules of the game. There are n * n vertical pegs. Each peg can accommodate up to n balls. A peg can be specified by its x- and y-coordinates (1 <= x; y <= n). A ball on a peg can be specified by its z-coordinate (1 <= z <= n). At the beginning of a game, there are no balls on any of the pegs. On his turn, a player chooses one of n * n pegs, and puts a ball of his color onto the peg. The ball follows the law of gravity. That is, the ball stays just above the top-most ball on the same peg or on the floor (if there are no balls on the peg). Speaking differently, a player can choose x- and y-coordinates of the ball, but he cannot choose its z-coordinate. Three-dimensional diagonals. For example, (5, 1, 3), (4, 2, 4) and (3, 3, 5) is a 3-sequence. There are four directions in this category. The input consists of multiple datasets each corresponding to the record of a game. A dataset starts with a line containing three positive integers n, m, and p separated by a space. The relations 3 <= m <= n <= 7 and 1 <= p <= n3 hold between them. n and m are the parameter values of the game as described above. p is the number of moves in the game. The rest of the dataset is p lines each containing two positive integers x and y. Each of these lines describes a move, i.e. the player on turn puts his ball on the peg specified. You can assume that 1 <= x <= n and 1 <= y <= n. You can also assume that at most n balls are put on a peg throughout a game. For each dataset, a line describing the winner and the number of moves until the game ends should be output. The winner is either "Black" or "White". A single space should be inserted between the winner and the number of moves. No other extra characters are allowed in the output. In case of a draw, the output line should be "Draw".